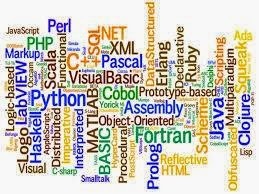 web developer Meaure Programming Languages perfomace.python to visual basic. What it is: A high level, all purpose programming language that prides itself on its readability. It’s often used as a scripting language, though it can also be compiled. Biggest complaint: Indentation is used to specify block structures rather than brackets or braces. Also, heavy use of colons and underscores and module/variable name collision. How To Get Rid: Don’t work at Google, Yahoo or NASA. What it is: The Laboratory Virtual Instrument Engineering Workbench is actually a development environment for G, a visual, dataflow programming language, used for measurement and control systems. Programmers use LabVIEW to connect functional nodes via “wires” to determine execution. Biggest complaints: The GUI programming approach can make anything beyond the simplest of tasks extremely complex. How To Get Rid: Stay away from jobs programming instrument control (particularly lab instrumentation) or industrial automation. Also, avoid helping your kids with LEGO MINDSTORMS projects. What it is: An interpreted language, originally developed by Netscape, used primarily as a client-side scripting language on web pages. It’s also been implemented for server-side web scripting and as an embedded scripting language. Biggest complaints: Case sensitivity, different implementations across browsers, lack of debugging capabilities (though Firebug solves that) and odd inheritance rules. How To Get Rid: Don’t work as a web developer. What it is: Developed as an embedded command language, the Tool Control Language has evolved into a general purpose scripting language used for things such as web applications, network administration and test automation. Biggest complaints: The syntax is almost too simple, it lacks pointers so there’s no way to pass by reference, arrays are stored as strings, it has poor list semantics and confusing variable scoping. How To Get Rid: Don’t work for Cisco, AOL or CNET or anyplace using AOLserver or the OpenACS platform. What it is: A language first specified in 1959, designed primarily to support business applications and government administrative functions, COmmon Business-Oriented Language legacy systems are still widely in use. Biggest complaints: Extremely verbose syntax (it was intended to be readable by non-programmers), incompatibility between versions, and, prior to COBOL 2002, lack of support for object oriented-programming, functions and pointers. How To Get Rid: Don’t work in government, financial services or for the military. What it is: An intermediate-level language created as an extension of C which supports, among other enhancements, object oriented programming. It remains one of the most popular languages, used in a wide variety of systems and applications. Biggest complaints: Too big of a feature set, manual memory management, slow compilation speed and the fact that it allows programmers to switch between object oriented and procedural code in the same program. How To Get Rid: Don’t work for Adobe, Google or the gaming industry, in general. What it is: An interpreted language most often used for server-side scripting to generate HTML pages dynamically. It can also be used as a stand alone scripting language on many operating systems. Biggest complaints: Inconsistent naming conventions for its many functions, security holes, no native support for Unicode, plus it often gets mixed in with presentation code (e.g., HTML, CSS). How To Get Rid: If you do any web-based work it’s hard to avoid, but, for starters, don’t work for Facebook, and stay away from Wikimedia, Wordpress, Joomla and Drupal. Biggest complaints: The syntax is too verbose, it’s slow, it’s not easy to pass functions, the API’s are over-engineered and lots of other languages can do what it does, but more efficiently. How To Get Rid: Don’t develop any apps using the Android SDK. What it is: A high level, interpreted, all-purpose language that’s been called a “Swiss Army chainsaw” and the “duct tape of the Internet.” Perl is used for everything from CGI scripting to system and network administration. Biggest complaints: The main criticism against Perl, consistently, is that there too many ways to do things. So many, in fact, that it’s essentially a write-only language, meaning Perl code becomes impossible to read (and, ultimately, maintain). How To Get Rid: Don’t become a programmer. What it is: A programming language and integrated development environment used primarily in the development of Windows applications with graphical user interface. Created by Microsoft and meant to be easy to use for beginners, applications are built using a combination of graphical, drag-and-drop techniques and writing code. Biggest complaints: Its syntax is considered too verbose and strange, it requires dynamic link libraries to run, it has poor support for objected-oriented programming and the fact that it hasn’t been officially supported by Microsoft since 1998.